Heavy metal has always been fascinated with monsters and horror since the days of Black Sabbath. The macabre has always been a good match with a gloomy riff or tortured scream. Now, America's own Iced Earth attempt one of the most ambitious mergings of metal and monsters yet with the aptly titled "Horror Show". "Horror Show" isn't concerned with gory slashers like Jason or Freddie or with Satanic themes. Rather, it concentrates on the classics. Timeless characters like Dracula, the Wolfman, Frankenstein, and the Phantom of the Opera are examined here. The lyrics are usually from the point of view of the monster being examined and give a different, more human perspective to the fiends. Some of the tracks become almost mini-operas in their complexity. If the lyrics concentrate on classic horror themes, the music is classic heavy metal. 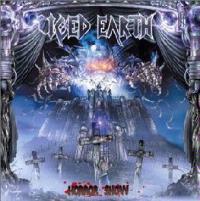 Iced Earth have been called America's answer to Iron Maiden and the comparisons are obvious. A speedy twin-guitar attack, a judicious use of melody, a leather-lunged vocalist, fantasy-based lyrics and a "mascot" that appears on each album cover, but Iced Earth are no Maiden clones. They've marked out their own territory and have their own unique sound, due mostly to the distinctive fast-picking guitar riffs of Jon Schaffer and the strong vocals of Matt Barlow. The material on "Horror Show" is not a million miles away from what they've done on past efforts like "Something Wicked This Way Comes"
and "Burnt Offerings" but that's no major drawback. So, poor mortals, turn up your lights, gather up your crosses and guard your souls, as you venture into the depths of the "Horror Show". The tragic tale of the Wolfman, Larry Talbot, is told in this opener. And like a werewolf itself, the track is a raging beast. Tasteful speed metal is combined with full blast drumming from Richard Christy (Death, Control Denied) to give us an archetypal Iced Earth screamer. This is the record's real epic, a retelling of "The Omen"'s youthful Antichrist, Damien Thorne. Choral voices singing ominously in Latin begin the track, which goes from mysterious acoustic tones to a crunchingly heavy verse. The chorus is extremely involved. Almost like a heavy metal soundtrack, this one features some really vicious anti-Christian lyrics. Jack the Ripper goes under the knife, as it were, in this track. Another speed metal belter, with some of the album's fastest picking and a very memorable chorus. As almost always, there is a brief acoustic interlude in the middle. The record departs from its horror movie theme for this one track, which is dedicated to all those soldiers who have fought and died in America's wars. This is a very melodic ballad that reminds me of Kansas in a lot of ways, but which gets heavier on the chorus and ends with some very dramatic vocal dynamics. I was disappointed by this retelling of the classic Mummy story. No, not the Brendan Fraser dribble, but the Karloff version of the tale. The opening and ending chords sound appropriately Egyptian but the part in between seemed pretty average and doesn't hold the attention. Shame on the band for misspelling Jekyll's name! Nevertheless, this is my favorite track on the album. It is real British influenced metal, where those Priest and Maiden touches shine through. The piece includes great riffing and some ripping melodic guitar soloing. It's time to visit the Black Lagoon and meet the Creature for this simple but effective song. The main riff is mid-paced and pretty catchy. One of the heavier tracks, this one never really speeds up, but the guitar hits you in the face. It has a mid-paced, marching tone to it. It's told more from the point of view of Dr. Frankenstein than the Monster he created. "Dracula" starts as a very subdued, restrained ballad and proceeds in that fashion for a good while before finally erupting into a powerful speed metal track. The chorus reminds me a lot of Blind Guardian...not unusual when you consider that guitarist Jon Schaffer plays with B.G. 's Hansi Kursch in their side project Demons and Wizards. This one grew on me quite a bit. The album proper winds up with the most ambitious track, an epic version of The Phantom of the Opera. It begins with very baroque melodies and then goes into a complex, lengthy song. There's some great vocal trade-off here between a female vocalist playing the part of "Christine" and Matt Barlow taking the part of "Erik the Phantom". There's also some good enhancement from a very classical sounding organ. You can't help comparing it to Maiden's "Phantom of the Opera", but this has its own style.